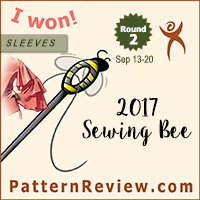 So while I haven’t been posting or sewing much lately, I have been thinking about sewing and acquiring lots of new fun fabrics and patterns in the last half month. Firstly, Fashionista Fabrics had a huge sale of old Burda World of Fashion magazines. Sadly, they are all sold out now, and they currently only have June 2011 and July 2011 in stock. I, however, was lucky enough to snag some old BWOF magazines. Oddly, while I find some of the styling and fabric choices very dated, I love many of the patterns in these issues. There are at least 3-5 patterns in each issue that I absolutely have to make at some point in the future, but there are about 10-15 patterns that I like from each edition. I am in love with the September 2003 issue. There are at least 7 must make patterns, and another 6 in contention. It is my favorite issue so far in my small but growing Burda collection. It is sort of odd to look at these magazines and think that I was in elementary/middle/high school when these were published. It is sort of odd because a lot of these magazines talk about trends that are coming around again (like exposed zippers), but I never really noticed them as trends in my younger days. 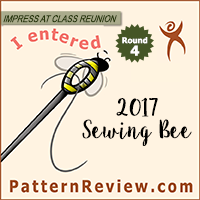 There are some things in the older BWOF that aren’t in the newer Burda Styles, such as recipes, pattern alteration tips (one of these discussed large hips/small waist – worth the price just for that article! ), and fashion destinations (one issue talked about Paris fashion, and another fashion in Sweden). Also, looking at the older tracing sheets, I can see why people are so upset by the new ones, but, having started with the one sheet mess going back to the older BWOF will just make things easier for me. I will say, I do like the new “Best of Burda Style” section in the new BurdaStyle magazines where they make four outfits mixing and matching pieces from the current and previous issues, as well as adding accessories. I think it really helps to see how to maximize a piece’s potential and it often helps me look at some of the patterns in a different light. Although, mostly, it just makes me sad that I don’t have access to some of the older patterns. Overall though, I am super excited by my Burdas and I can’t wait to start using the patterns. Sadly, I have a few other things that need to get done first, but after that there may be a long string of Burda items making way to my closet. I will, however, have to figure out the best method for cataloging the patterns in these magazines. The Russia Burda archives don’t go back farther than 2000, and they don’t show all of the pattens or line drawings for many of the older issues. Ah, well. A happy problem to have I suppose. Ok, so aside from stocking up on the patterns, I have also accumulated lots of fabrics. Although really, it isn’t quite as bad as it seems. Firstly, I bought fabric online from Fashion Fabrics Club as a starting point for my sister’s up and coming wool coat. 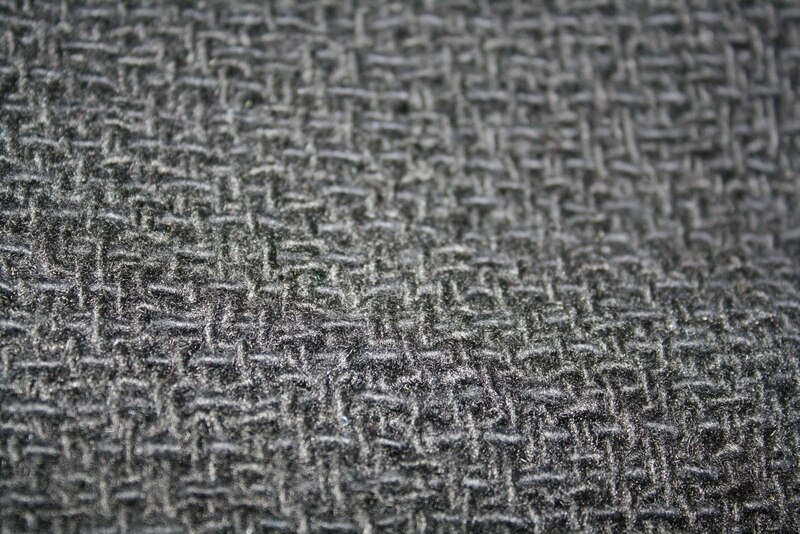 Close up of the black wool. It is a true black, but I needed flash to show texture. But while I was there I couldn’t resist throwing in some slinky fabric ($4) for a skating practice dress, and some lavender rayon jacquard for a Vogue vintage dress for my sister. 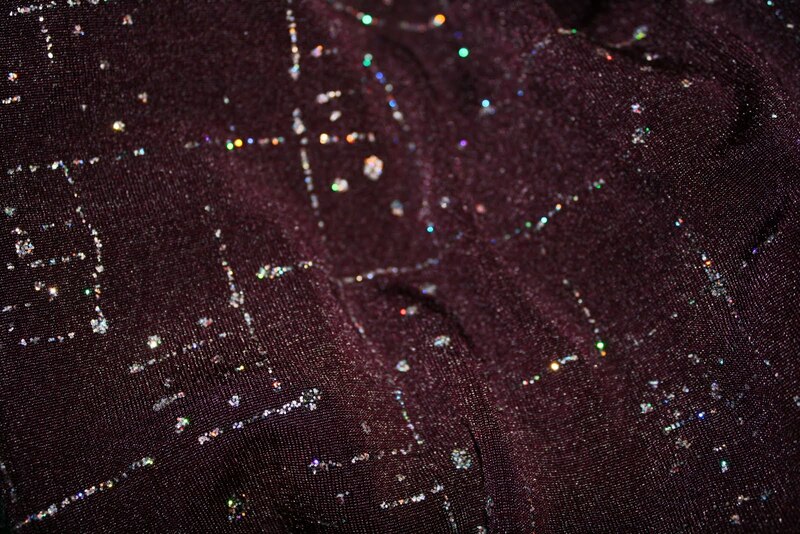 Slinky glitter fabric for a skating dress. I had gotten 2 patterns for her summer dress, and while we had decided that V8727 (review to come) was actually the better pattern for the fabric, my sister fell in love with V2960 and wanted a dress exactly like the one on the envelope. 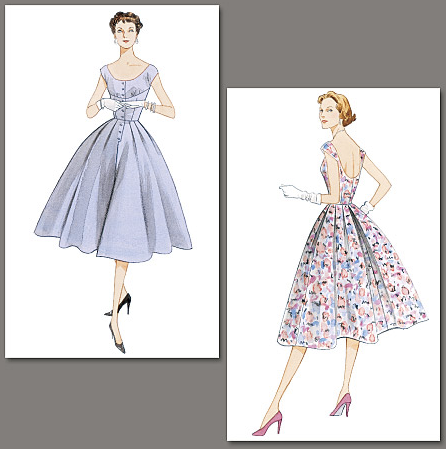 V2960 – My sister wants the one on the left. I really love this fabric – it is soft and drapey, but I have a MAJOR problem with it – it doesn’t wash well at all. The instructions say to wash cold, but a sample swatch went through the washer and dryer and it didn’t even look like the same fabric after. There is some major shrinkage going to happen, so it needs pre-treating, but I am debating to wash cold/air dry or if I should try to steam shrink in the dryer. I may have to test both methods and see which works better. If there are any other suggestions please let me know. 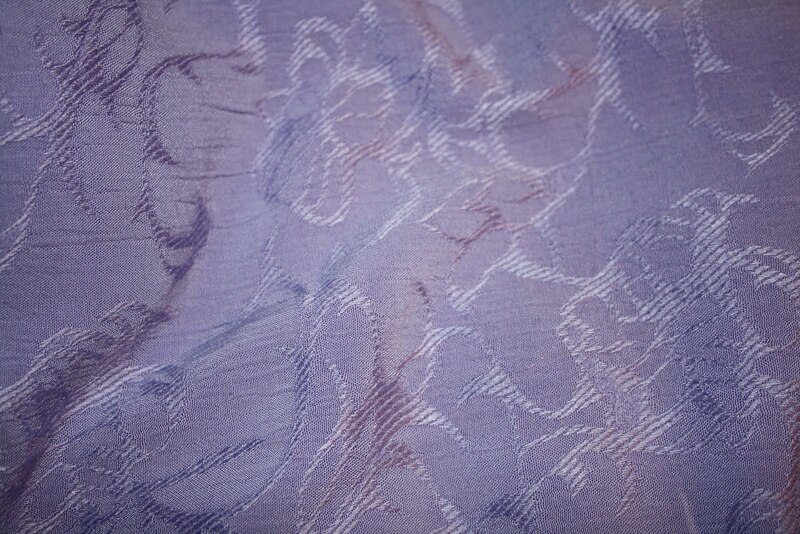 I also got some purple silk charmeuse from Fabric Mart for the coat lining. 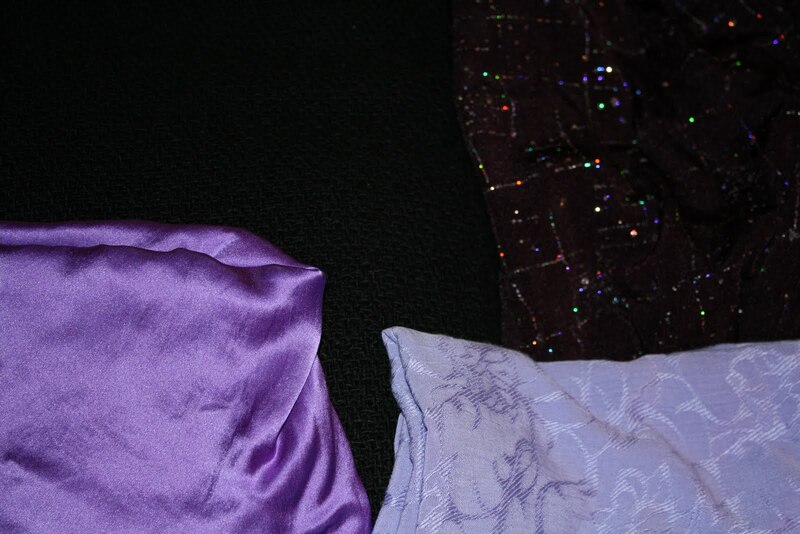 Planned purchases – the purple silk is bottom left. The black wool is top left. More mystery – black wool? 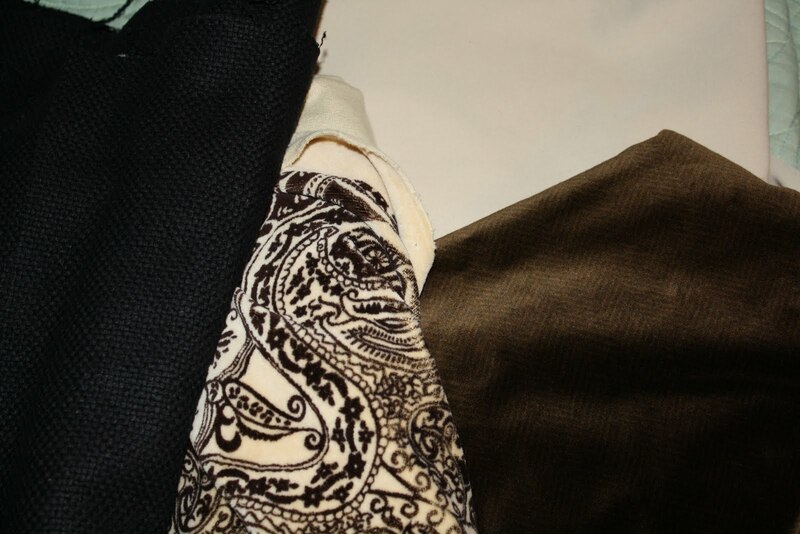 left, paisley and brown velveteens, beige polyester upper right (soon to be pants). 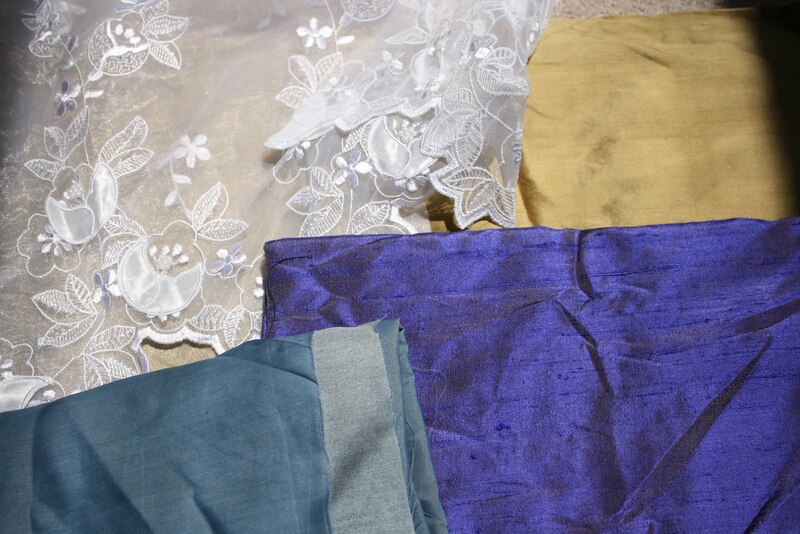 The pretties (clockwise from upper left): embroidered organza, gold silk, blue/gold silk, light blue silk. This is a TON of fabric for $20. I think I got something like 4 yards of the navy lycra, 3 yards of the beige polyester, and 1-2 yards of the other fabrics. I have plans for a lot of them already – a few jackets and some costume pieces. 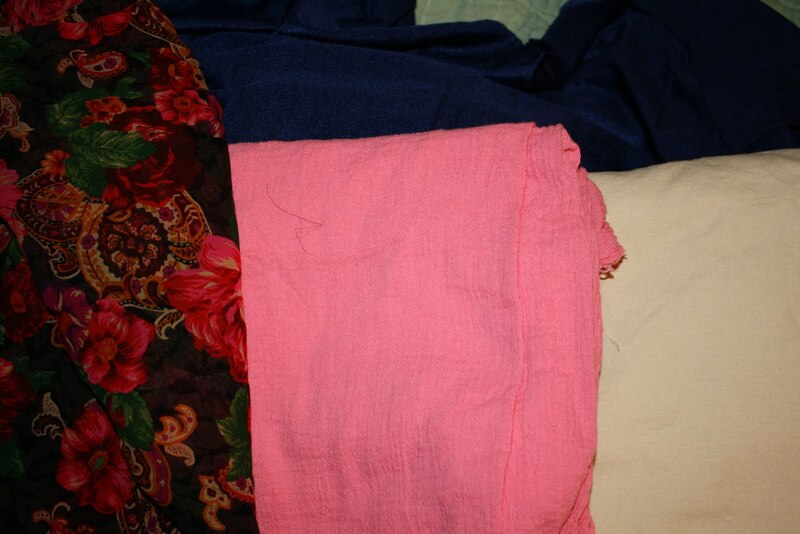 Maybe some shirts from the light blue silk and the bright pink cotton. In any case, I like the mystery box and I will probably order it again when I order from FFC. 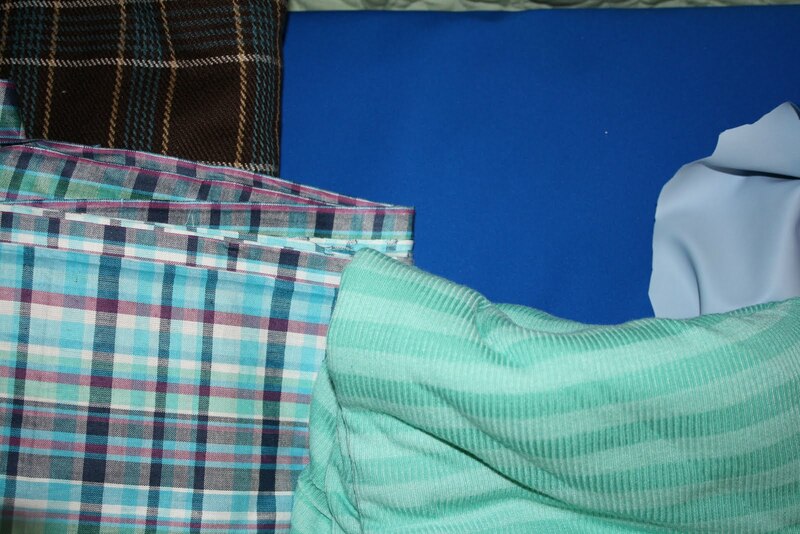 From Hancock (clockwise): plaid acrylic for a skirt for the sister, blue rain-proof fabric for a jacket, green cotton/poly jersey for a shirt, plaid cotton for a shirt. 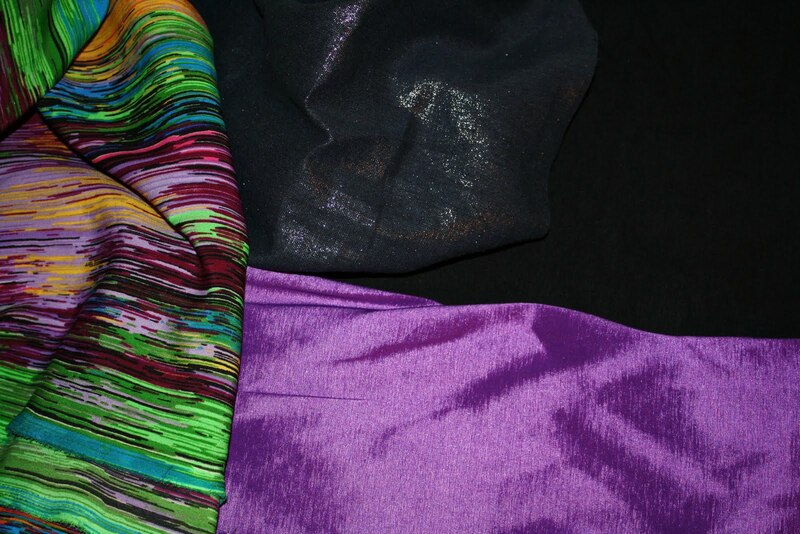 From JoAnn: Poly rainbow print, metallic print linen ($3), black rayon jersey, purple stretch taffeta. 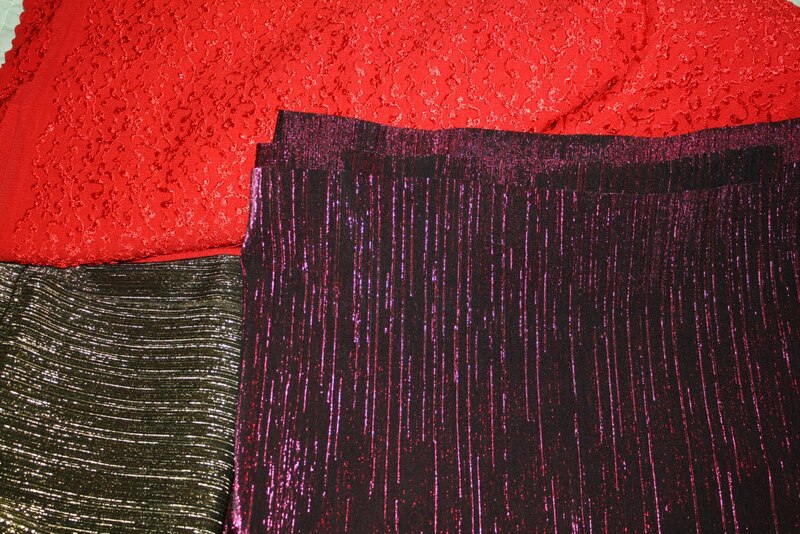 From Hancock: Red stretch “lace,” gold and pink stretch metallic fabrics, all for skating costumes. 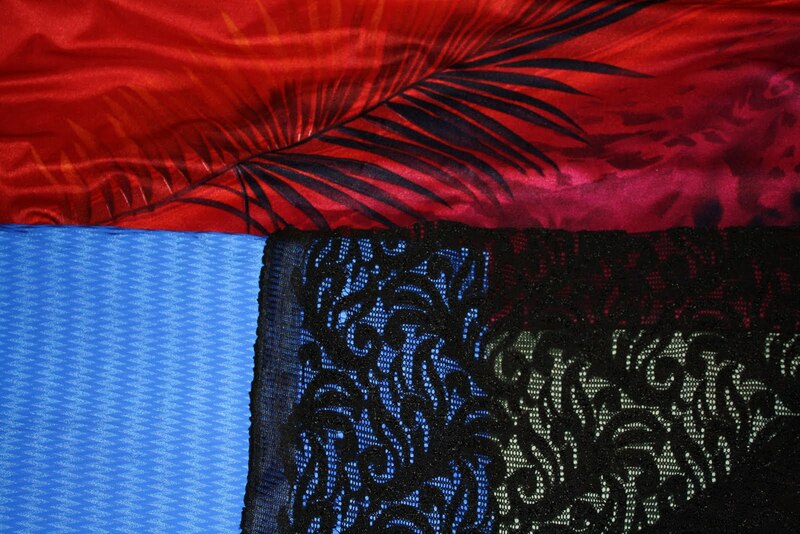 More from Hancock: printed red lycra, blue lycra, black stretch lace. So yay! Major stash accumulations in the past month. Now that I am back and done studying I really need to get back into sewing stuff up so I can stop thinking about it and actually wear it.